On July 1, 2000 Florida State University (FSU) assumed governance of The Ringling. It was a major milestone in the Museum’s history, one that would help the then struggling Museum to establish itself as one of the nation’s cultural centers. The transition occurred primarily through the efforts of former Senator John McKay (who was then President of the state Senate) as well as other local Museum supporters – Bob Blalock of Bradenton and Senator Bob Johnson of Sarasota prominent among them. These philanthropic leaders in the community understood that Florida’s University System offered benefits that could greatly benefit the institution. Chief among them was that State Universities enjoyed two matching gift programs that would double contributions for new buildings and match money raised for endowments. Having the Museum come under the governance of the University was a natural fit. FSU had established a presence in Sarasota as far back as the 1960s by offering actor training at the Museum’s neighbor, the independent Asolo Theater Company and in 1973 established a master’s degree program in acting in partnership with the Theater. The Museum also offered one of the most elegant settings for a college art museum in the world, with a collection worthy of comparison with those at Harvard and Yale. But one major obstacle stood in the way of the merger: the condition of the Museum, which had passed through a period of neglect and needed restoration before the University could devote academic resources to it. Responsibility fell to the Florida Legislature. After long negotiations, the State pledged to restore the Ringling Estate and the University pledged to develop a program of academic excellence at the University’s new cultural campus. Within months $7 million was secured to make necessary repairs to existing buildings, enhance the grounds infrastructure and to complete the massive restoration of Ca’ d’Zan. 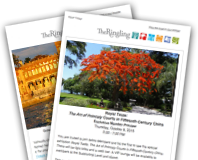 Now the State Art Museum of Florida, The Ringling is one of the 20th largest university museum complexes in the nation and one of the most significant cultural and educational centers. It stands as a testament to the collaboration between the State, FSU and the work of local individuals all of whom understood the enduring importance of John Ringling’s legacy.